This is the ALTAIR 4X Multi-Gas Detector. It surpasses the industry standard in several crucial areas. One of these areas is that its four year sensor life is 60% longer than the industry average. Another is that it has a 24 hour run time which exceeds the industry average by 71%. Industries ranging from fire fighting to welding will find this versatile portable detector a perfect match for their company. Due to the digital sensor output this product is less likely to suffer from RF Interference. 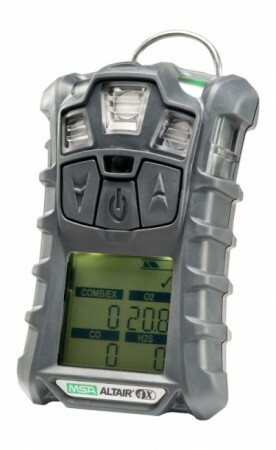 This is the ALTAIR 4X Multi-Gas Detector. It surpasses the industry standard in several crucial areas. One of these areas is that its four year sensor life is 60% longer than the industry average. Another is that it has a 24 hour run time which exceeds the industry average by 71%. Industries ranging from fire fighting to welding will find this versatile portable detector a perfect match for their company. Due to the digital sensor output this product is less likely to suffer from RF Interference. The MotionAlert™ lets others know if the user has become immobile and InstantAlert™ is a manual alarm which alerts others of potentially dangerous situations. This rugged unit has been designed to withstand a drop of up to 20 feet and it uses less than half as much calibration gas as the industry average. As a cheap little detection unit this product measures the main gases which can cause a problem within the working environment and it is perfect for keeping health risks at a minimum and making sure everyone in contact with your business is safe.